As most people who have ever met me know, I love cheese – not just liking it but being utterly mad about it (so much so that I even make my own cheese). For years, I was planning to visit the Cheese Festival at Melton Mowbray and this year, I finally made it in the company of Sandra Murphy and Peter Loughnane of Cork Airport Hotel – my partners in crime for the upcoming Cork Cheese Week (more to that later). We had the pleasure of being invited by Matthew O’Callaghan, organiser of the cheese festival (and many others) in Melton Mowbray and he gave us a great insight into the running of a cheese festival. The British Cheese Awards also take place in Melton Mowbray and it was wonderful to see the many Irish winners amongst the awards. CAIS was represented by Cashel Blue, Corleggy, Ardsallagh, Killeens, Durrus, Gubeen and other cheese makers. Anyhow, this is not an article about cheese but cheese crackers. 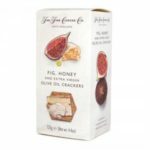 I simply love the idea of matching crackers with cheese and it wasn’t long before the crackers were just a small pile of crumbs. 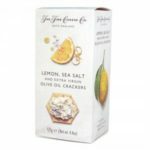 Utterly delicious, the lemon and sea salt crackers were my absolute favourite and I am already scribbling down ideas on how to re-create them at home. 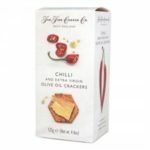 You can check The Fine Cheese Co. out online, although they have a great shopping site, they only deliver into GB mainland only. They export their products but I couldn’t see a list of distributors. So, back to my scribbling board and trying to figure out how to make these little beauties. Please let me know if you are coming across these crackers anywhere in Ireland…. they are utterly delicious.